There are several medical conditions that can increase your risk of having a heart attack. One of them is heart disease, which is phrase that includes several things we’ll discuss in a minute. Uncontrolled diabetes can significantly increase your chance of having a heart attack. If you have heart diabetes and control it, your chance of having a heart attack is moderately higher than someone of your age and condition. If you have diabetes and don’t know it or don’t control it – your chance of having a heart attack is significantly higher than that of others of your age and condition. The same holds true for blood pressure – with an added wrinkle: high blood pressure usually doesn’t show any symptoms. We call it “the silent killer” for a reason. So what can you do? Make sure that you go and get a physical. It doesn’t matter how old you are – you should start in your twenties to make sure you have a baseline. If you don’t have access to a physical for whatever reason than we recommend that you get a screening – high blood pressure and diabetes are easy enough to detect with inexpensive, easily available tests. Local hospitals, health cares, community fairs and the like often offer free screenings. Heart disease can include high blood pressure, but also high cholesterol and other issues. There are many treatments available. Follow the suggestions of your physician and make sure that you take your medication as prescribed to you. Diabetes, high cholesterol and high blood pressure have one more thing in common – your diet can have a huge impact on the severity and management of these diseases. You need to follow the suggestions of your healthcare provider, and do some research on your own. Most people know that diabetics shouldn’t eat sugar – so they use artificial sweeteners and eat sugar free chocolate. What a lot of people don’t know is that certain foods, white bread is one example, are essentially sugar in your system. If you are a diabetic, simple carbs are bad for you. There are a lot of options for finding this information, including meeting a dietician or going to meetings. There’s also a lot of research that is easy to find. We’ll talk more about diet and heart disease in another post. Remember, if you would like a class in CPR or First Aid in South Florida, please contact me to set it up. If your local non-profit would like a short, free presentation on heart attack symptoms or risk factors, please let me know and we’ll see of we can arrangement. All of these disorders need to be evaluated and treated by a medical professional. Heart disease is the leading cause of death for American adults, and it has been for many years. Although we are all familiar with the words, there are a lot of things about heart disease that most people don’t know. It turns out that there are risk factors for heart disease that you can change, and risk factors for heart disease that you cannot change. Does heart disease run in families? Yes. If people in your immediate family have been diagnosed with heart disease, than you have a higher risk of having heart disease, as well. People with this risk factor should get an overall check and be screened for high blood pressure, diabetes and high cholesterol at least every year. I have diabetes or high blood pressure. Should I be worried about my heart? Yes. Having diabetes and/or high blood pressure significantly increases your risk of having a heart attack. If you have one (or both) of these disorders and control it well than your chance of having a heart attack is only slightly elevates. We recommend regular screenings for high blood pressure and diabetes, and a treatment plan that includes diet and exercise as well and taking the medication you are given when you’re supposed to take it. I’m getting older. Does that increase my risk of having a heart attack? Yes. Your risk of having a heart attack increases with age. That said, younger men are more likely to have heart attacks than younger women. Women almost never have heart attacks before menopause. This is all very grim. Do you have any good news for me? Of course. Those are risks that are hard to change. The best thing you can do about them is be aware, get your screenings and work to control any underlying conditions. There are risk factors we can change? Can you eat 10% better? Can you get 10% more of your calories from fresh food? Can you get 10% fewer of your calories from a box or a drive-through window? Just 10%?? Most of our students think that’s a really doable goal. Do 10% better for a month, then do it again. You’ll be happy with the result. Lack of exercise is an important risk factor as well. 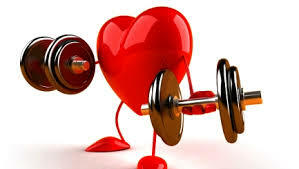 Your heart is a muscle, and like all muscles, it needs to exercise to be strong. Exercise has other benefits. It can lower blood pressure and cholesterol. It can also if weight is lost, help control adult-onset diabetes. Also, many people report that when they exercise more they crave bad food less (I just did all that work – I don’t want a burger). Exercise also reduces stress, which is the third controllable risk factor in heart disease. The current guidelines for exercise from Centers for Disease Control and Prevention are pretty modest. They’re looking for 20-30 minutes of brisk walking 5 or 6 days a week. That’s 150 minutes a week with an increased heart rate. If you want to do 3, 10 minute walks or circuits, that’s fine. They are also encouraging adults to do 2 days a week of resistance work (with stretch bands) or weight lifting. Again, CDC isn’t looking for power lifters, just moderate resistance exercise. Why? The aerobic exercise strengthens the heart, and occasionally encourages it to develop secondary blood vessels around any that might be blocked. The weight training helps in a variety of ways. Developed muscles burn fat faster, helping people maintain a healthier weight. People who lift weights or do resistance work also have better bone density, better balance, and improved flexibility. for more information and discuss appropriate exercise with your doctor. We know from our own experience that most people will only do exercise they enjoy. If you want to walk for fitness, but can’t always get out the door, ask a friend or neighbor to go with you. If you love to dance, turn up the radio and shake it out in the kitchen. Personally, I respond to group fitness because I enjoy the team aspect, so martial arts and Master’s Swim programs are a good fit for me. Once you find something you really enjoy, the fitness part of it will become much easier. Will all of this stuff prevent me from having a heart attack? I can’t promise that. I can tell you that being mindful of the first three and getting check ups and screenings will certainly help. Acting on the second three will keep you healthier for a lot longer.